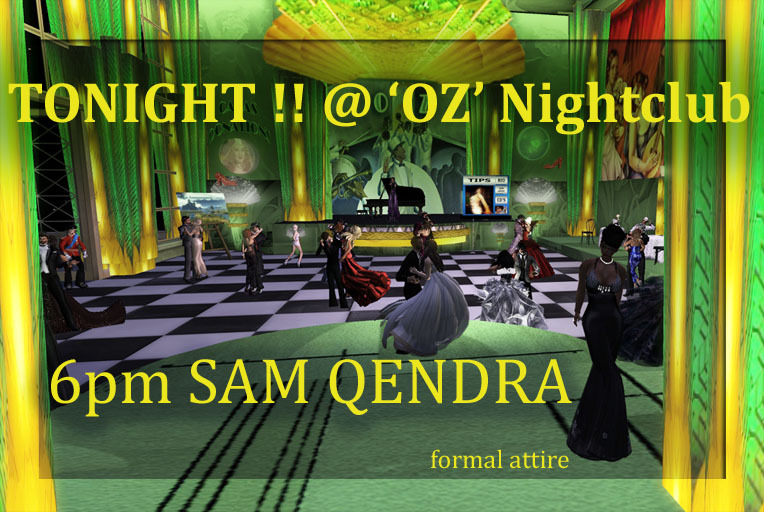 6PM SAMM QENDRA @ OZ NIGHTCLUB! It’s Sunday! Join us as our ‘Angel of Calas’ SAMM QENDRA returns to the beautiful deco style OZ NIGHTCLUB’ to help us get ready for the week ahead with an hour of her amazing vocals. Samm has been sharing her amazing talent at CALAS since the early days of our Live Music Program in 2011. How many of you remember the Spring Glass Pavilion high above the Calas Galadhon sim?Truly one of the most talented female singers in Second Life!! This entry was posted in Uncategorized and tagged Armenelos, Best of Second Life, Calas, Calas Galadhon Park Sims, OZ Nightclub, Samm Qendra by tymustenk. Bookmark the permalink.